At Least 17 Parcel Bombs Explode In Guangxi, China, Killing 7 : The Two-Way At least seven people are dead in a large city of southern China after a series of powerful explosions that are being blamed on parcel bombs. At least 17 explosions caused the damage. Damaged buildings are seen in Liucheng County in south China's Guangxi region. The death toll from 17 suspected mail bombs in the area rose to seven Wednesday afternoon. At least seven people are dead in Liucheng county in southern China after a series of powerful explosions that are being blamed on parcel bombs. 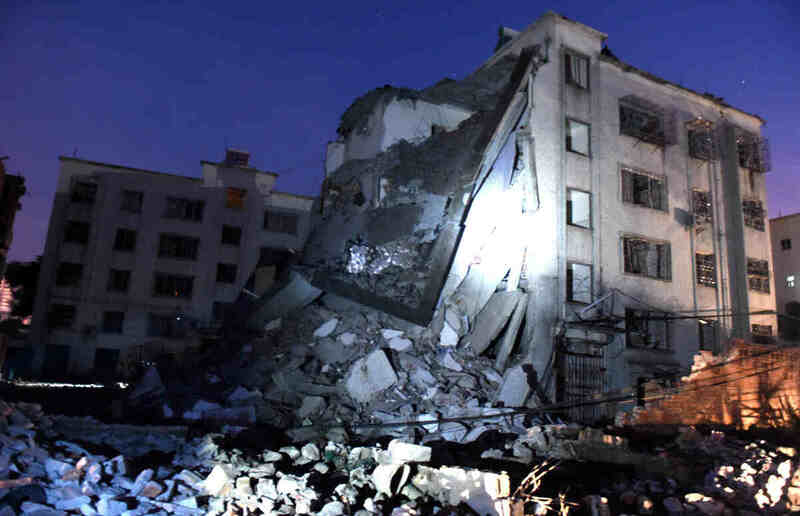 As many as 17 explosions caused the damage in and around the city of Liuzhou, according to local media. The blasts were strong enough to rip away portions of buildings and overturn cars. More than 50 people were reportedly injured. Police have arrested a 33-year-old man with the surname of Wei, reports the South China Morning Post, citing a local newspaper. Police are saying the attacks are a criminal case, not an event of terrorism. The explosives, which had apparently been hidden in delivery packages, struck in the afternoon, between 3:15 and 5 p.m. local time, state broadcaster CCTV reports. CCTV also says, "the public has been warned not to open any packages they've received recently." We'll update this post as more news emerges from the scene. China's Xinhua News agency posted photos on Twitter showing concrete rubble and overturned cars; China Central TV says the explosions occurred at locations including shopping malls, a government building, a bus station, a hospital and a prison. The explosions in and around Liuzhou city come one day before China celebrates its National Day, a public holiday honoring the founding of the People's Republic on Oct. 1, 1949. Liuzhou is the seat of its county in Guangxi, a region west of Guangzhou that borders Vietnam.